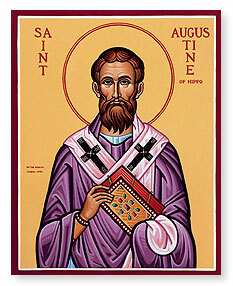 Universalis: St. Augustine of Hippo (present Algeria) led dissolute youth but was converted through his mother's prayers and St. Ambrose's teaching. Held Manichaean heresy, then became neo-Platonist. 34-year bishop. See Catholic Encyclopedia, Wikipedia. Restless Heart, the movie, but check out the mixed reviews first: Be forewarned, Uplifting, When bad movies happen to good people. For his mom, see yesterday. One Bread One Body: We know Jesus is coming again but don't know when; it motivates us to "stay awake" and prepared. Time is too precious to get entangled with petty stuff. In the light of the 2nd coming, material things lose their value. Jesus' coming isn't just about life after death; it transforms our lives now. Passionist: St. Augustine spent most of his life undergoing conversion: "You were within me, but I was outside, and it was there I searched for you... You were with me, but I was not with you." How often do we search outside for God (e.g. in wealth or status)? Conversion = let God be God in us; be servant; embrace consequences.